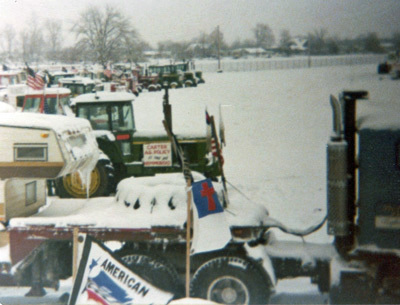 Tractors settle in to wait out a snowstorm in Indianapolis. 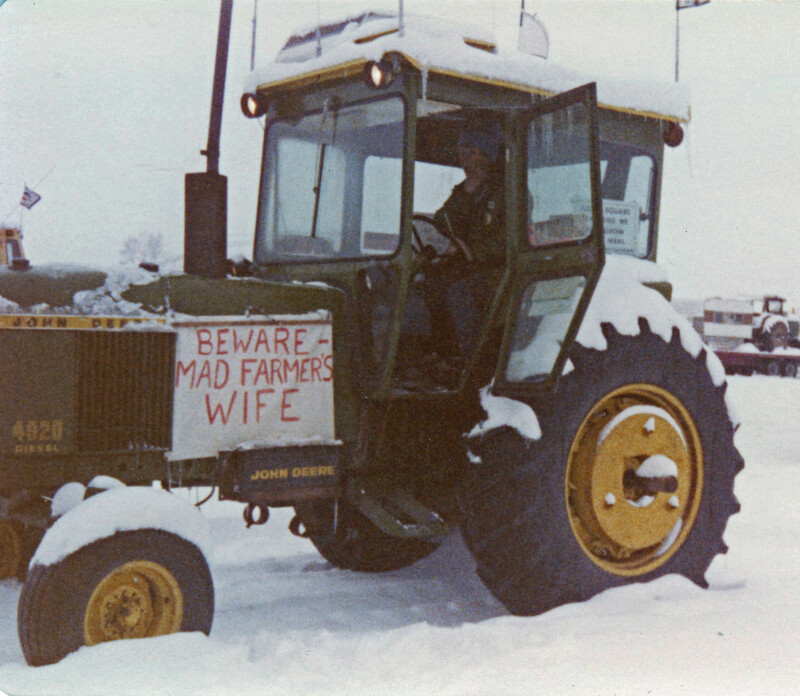 Support truck from Lewis, Kansas in Illinois snow. 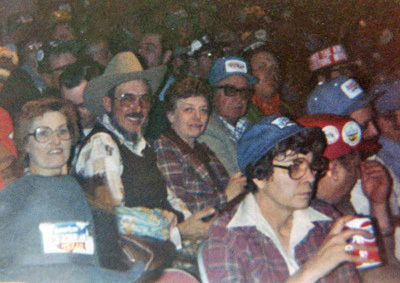 In January 1979, Edwards County farmers supported and joined other farmers from all over the United States to travel to Washington D.C. 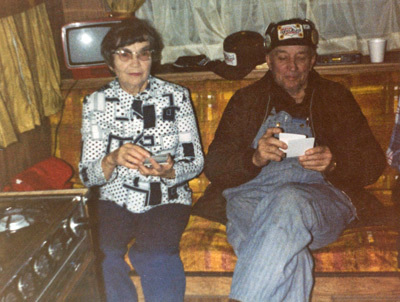 They climbed into their tractors and drove across the country, braving the cold and snow, to protest farm policy and call for parity. As the tractors moved east, (see MAP), traveling at 14 mph, they gained force and arrived in Washington, D.C. on the morning of February 5th, 1979. The farmers blocked off intersections and paraded their tractors in front of the Capitol. Police blockaded the farmers and their farm vehicles onto the National Mall near the Washington Monument. For the next seven weeks this location became the base of operations of the American Agriculture Movement as the farmers lobbied and demonstrated for parity. D.C. Police keep a close eye on demonstrators. 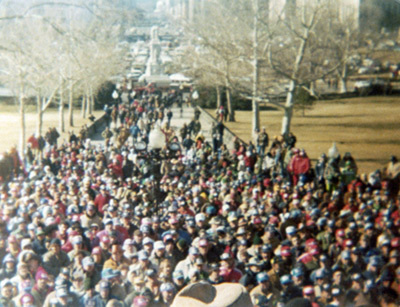 Theirs is a truly American story of individuals banding together to take their concerns to their elected officials in a very dramatic and powerful way. Those from Edwards County, Kansas who made the trip all the way to Washington D.C. included: W. A. and Clara Stapleton, Beverly Snyder, Ed and Marjory Scheufler, Lester Derley , Darrel and Karen Miller. Many others, supported them back home. In second row, Marjory and Ed Scheufler, Jean and Junior Titus listen to AAM speaker. Beverly Synder drove the whole way to D.C.
Tractorcade to D.C. is the result of a Kansas Humanities Council 2012 Heritage Grant in support of an oral history project. This project was also sponsored in part by the Edwards County Historical Society. The research was shared with the Edwards County Historical Society, the Kansas Historical Society and Kansas Memory website. Grant documents: (Grant Application),(Evaluation), (Invitation). 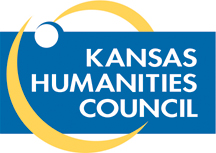 Principal funding for this project was provided by the Kansas Humanities Council, a nonprofit cultural organization promoting understanding of the history, traditions, and ideas that shape our lives and build community.